Our neighbor from the next street has a few goats (like Aviad did once upon a time) and he brings them to graze on the field behind our house. I like goats, they're realy funny, and they run away from all the time, daddy says I can be a professional herder if I want - I'm so good! 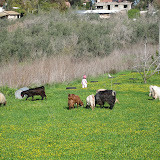 Then Heshi came to help and we spent a few hours runing around the garden with and without the goats. You know I can prove it!!! 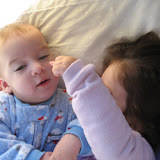 Also some pictures daddy took of me and Daniel one morning when we were playing in mommy's bed.